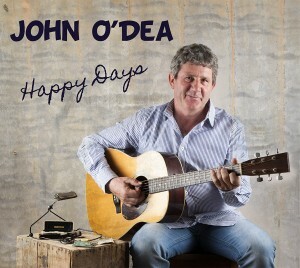 I’m John O’Dea and this is my new album, “Happy Days”. I recorded this album at the Swingin’ Door Studio in Sydney with Stuie French. This album was an absolute pleasure to do and with Stuie, (All guitars, Banjo, Uke), Michel Rose (Steel Guitar, Dobro and Mandolin) , Chris Haigh (Bass), Scott Hills(Drums) and Garry Steel (piano accordion, Piano) playing on the album it is everything I wanted it to be. To have Camille TeNahu and Kevin Bennett, two of Australia’s finest singers, featuring on the album, I feel very privileged. Truly Happy Days. Have a look in the shop for this album or more of my work. These are the tracks, I really hope you like them. Fishing (J.O’Dea) Fishing is a pastime that many Australians enjoy. Whether you’re catching lots or just sitting on the water enjoying the peace and quiet, it’s always fun. Son Of A Farmer (J.O’Dea) This is my story, from our ancestor leaving Ireland to take up land in Australia to now. We all have our hopes and dreams. Everything (J.O’Dea) We all have someone special in our lives, I’m lucky to have that someone and we all need to be loved. Shaney Boy (K. Johnson) I first heard this song many years ago. It was on Kevin Johnson’s album ‘Rock and Roll I Gave You Best years Of My Life”, a great song that I always wanted to record. It’s All I Know (J. O’Dea, D Proust, R. Sinclair) A song about leaving the land. This song is a duet which features Camille TeNahu one of Australia’s finest female country singers. Yesterday (J. O’Dea, T Maxwell) Have you ever said “I wish I’d done that yesterday”, I know I have more than once. This is a song I wrote with Tom Maxwell about just that. The Patchwork Quilt (R Essery, J. O’Dea) This is a poem written by Ray Essery, a wonderful bush poet, that I put the music to. It’s a beautiful little story. That’s What I’d Do (J. O’Dea, T. Maxwell) A Song about an old drover reflecting on his days in the saddle and if he got the option he’d do it all again. Wishing Tomorrow Was Today (J. O’Dea) A soldier on his way home from Afghanistan and his family waiting, all wishing that tomorrow was already here. Lend A Hand (J. O’Dea) I wrote this song as a tribute to the volunteers in this country, wherever they are and whatever they do. Our country would come to a standstill if they stopped doing what they do. I feel very privileged that Kevin Bennett (from Kevin Bennett and the Flood), one of this country’s finest singers joined me for this song. A Picture Of Home (S. Dusty, M. Cormack) A beautiful song of Slims’ about a Soldier telling of Australia and its beauty with soldiers from other countries. Thanks to Stuie French for introducing me to this song. This is our version of a great song. Pa’s Little Mates (J. O’Dea) I now have several Grandchildren, a true blessing. They are all Pa’s Little Mates. If you have Grandchildren you know exactly what I mean. Lost The Oldies ( J.O’Dea) This is for all the people out there travelling around Australia in their caravans, mobile homes and camper trailers seeing the beauty of this country and enjoying the fruits of their labour. Good on you, travel safe and enjoy. Happy Days (J. O’Dea) My Aussie Travelling Prayer. Wishing you all many Happy Days. Support my unique songwriting and check out the shop.